Grilled Vegetables with Olives, Tomatoes Fill 1 Created with Sketch. Romesco sauce is primarily a combination of nuts and red peppers from the northeastern Spanish city of Tarragona. 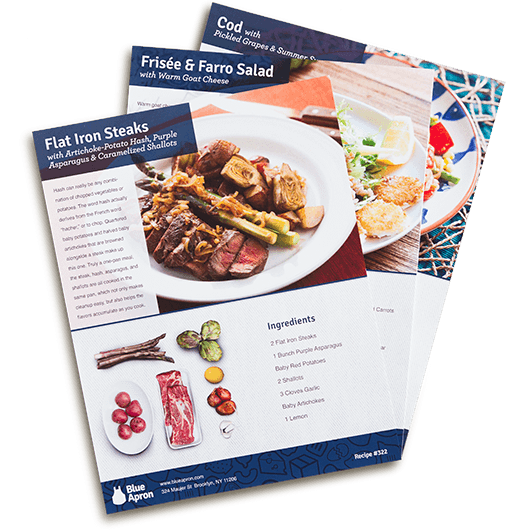 Fishermen may have created it to eat with seafood, but now it can accompany anything, especially vegetables. 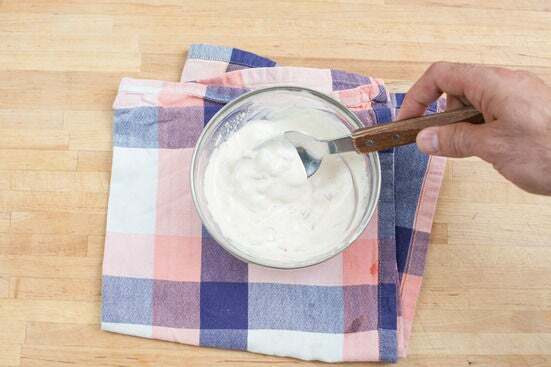 If you have a food processor or blender, you can use it to make the sauce smooth like in Spain, or maintain some texture by chopping the ingredients by hand, the way we did. Wash and dry the fresh produce. Trim the stems off the green beans. Peel and mince the garlic, smashing until it resembles a paste. 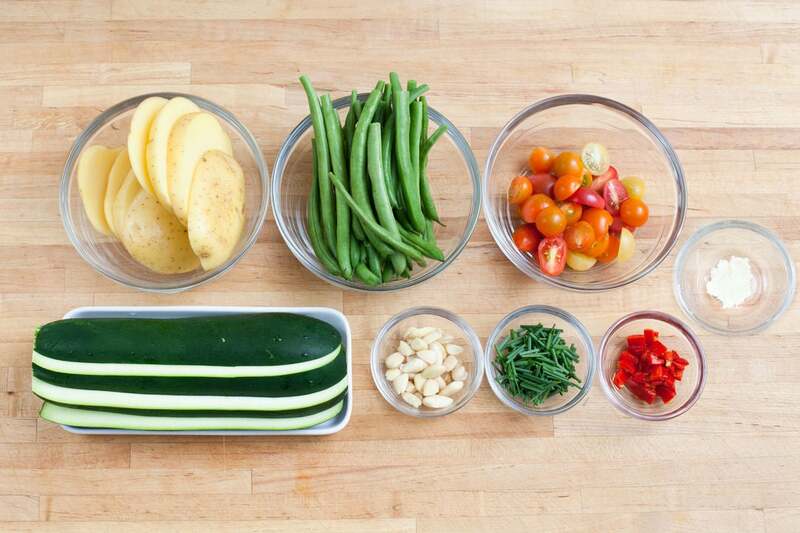 Slice the potatoes and zucchini lengthwise into ½-inch-thick planks. Cut the chives into ½-inch lengths. Finely chop the piquillo pepper. Roughly chop the almonds. Cut the cherry tomatoes in half. 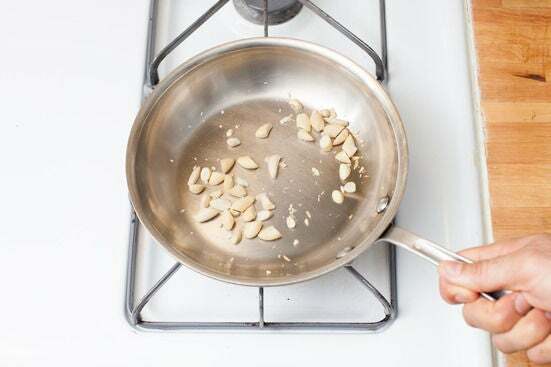 Add the almonds to a small pan. Heat the pan on medium-high and toast the almonds for 1 to 2 minutes, or until golden and fragrant, stirring frequently. Transfer the almonds to a small bowl. Repeat this process with the pine nuts for 30 seconds to 1 minute and transfer to a separate small bowl. Add the mayonnaise, sherry vinegar, piquillo pepper, half the garlic paste, and a splash of olive oil to the almonds in the bowl. Stir until combined. Season with salt and pepper to taste. 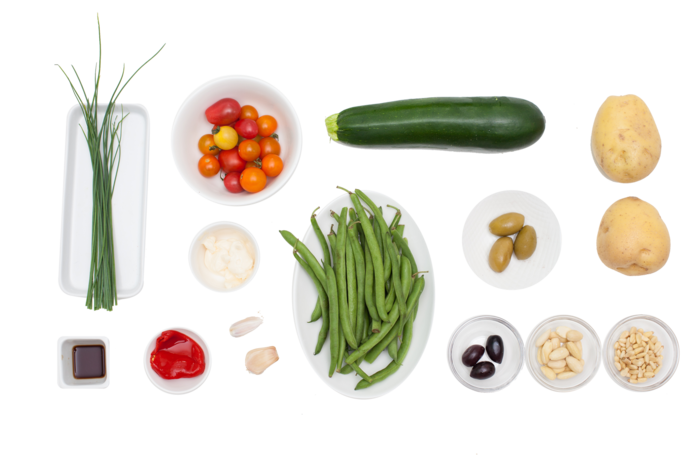 In a large bowl, combine the green beans, potatoes, zucchini, and remaining garlic paste. Drizzle in some olive oil and season with salt and pepper. Toss to coat everything in the oil and garlic. 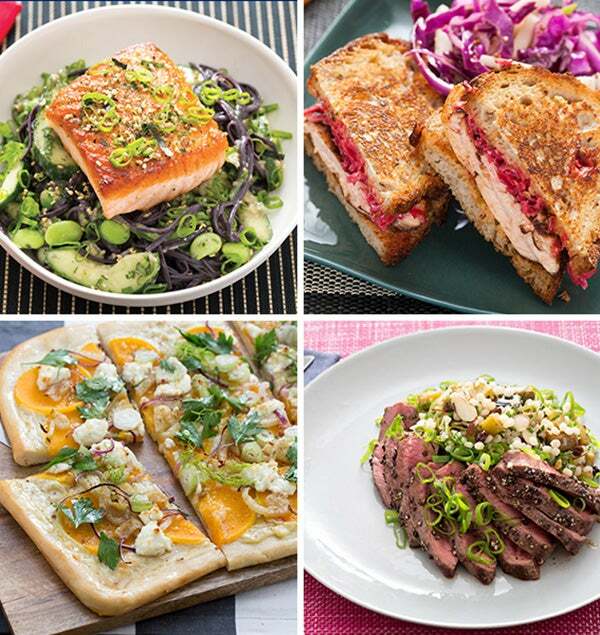 Preheat your broiler or grill on a medium flame. 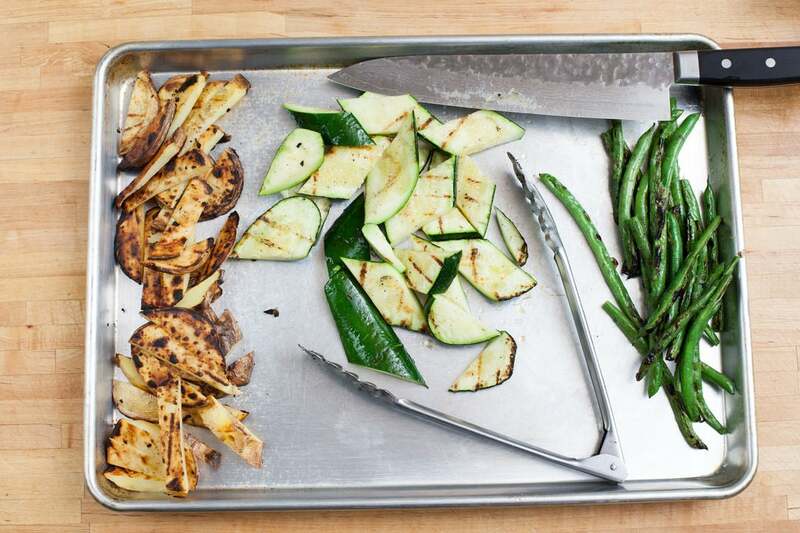 (You can also use a stovetop grill pan on medium. If broiling, use a broiler pan or broiler-safe baking sheet or dish set at least 4 inches from the heat source.) Grill the potatoes on a cooler part of the grill 12 to 15 minutes, or until tender, turning over once. 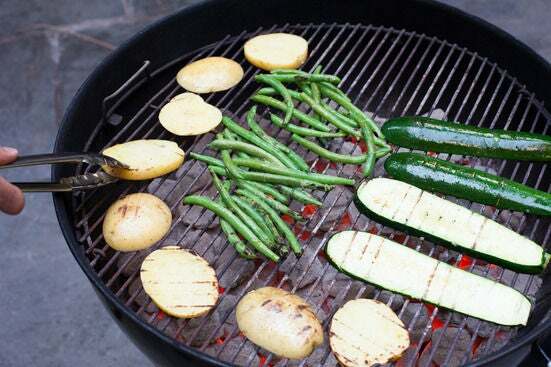 Grill the green beans and zucchini on the hotter part, 3 to 5 minutes, or until tender, turning over once. While still somewhat warm, cut the potatoes into strips. Cut the zucchini crosswise on an angle into bite-sized pieces. 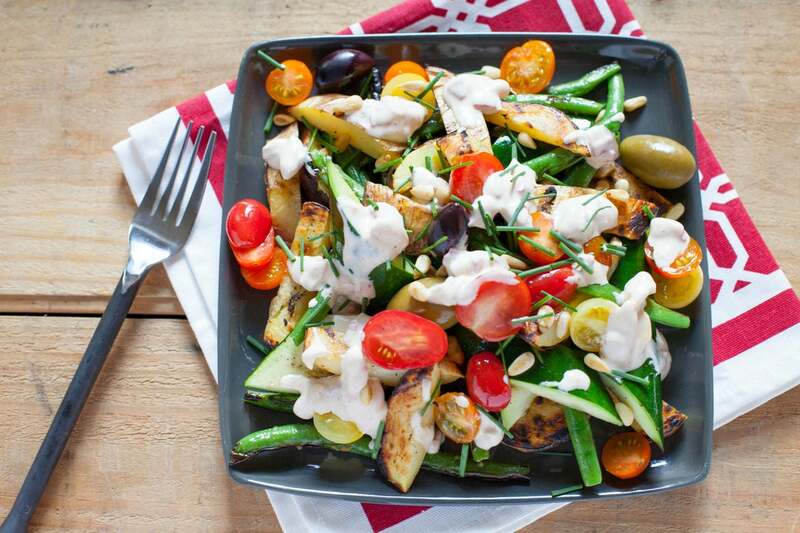 Divide the grilled vegetables and cherry tomatoes between 2 plates. Top each with half the olives (be careful, they have pits! ), chives, and pine nuts. 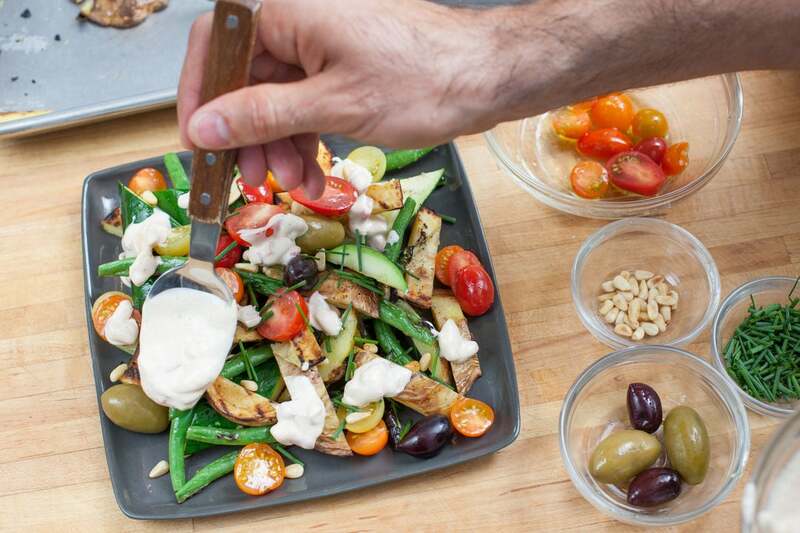 Spoon some romesco sauce over the top of each of each plate. Enjoy!